There is probably nothing more I need to say. I mean, chocolate and peanut butter. They’re like Meghan and Harry. Only, in food form. Meant to be together. All sweet, salty, and crunchy together. Forever. Until to death do they part. Heat, pour, stir, set. So easy. If I am being honest, I feel bad even calling this a recipe. Low in sugar. Super dark chocolate, you are my superhero. Gluten free and dairy free without even trying. Sweet enough to smash your cravings. Rich enough that you can’t eat it all at once. But if you try. No judgment here. Salty peanut crunch is the best kind of crunch. Am I right? Awesome -take to someone’s house food – looks AMAZING, but so bloody easy. 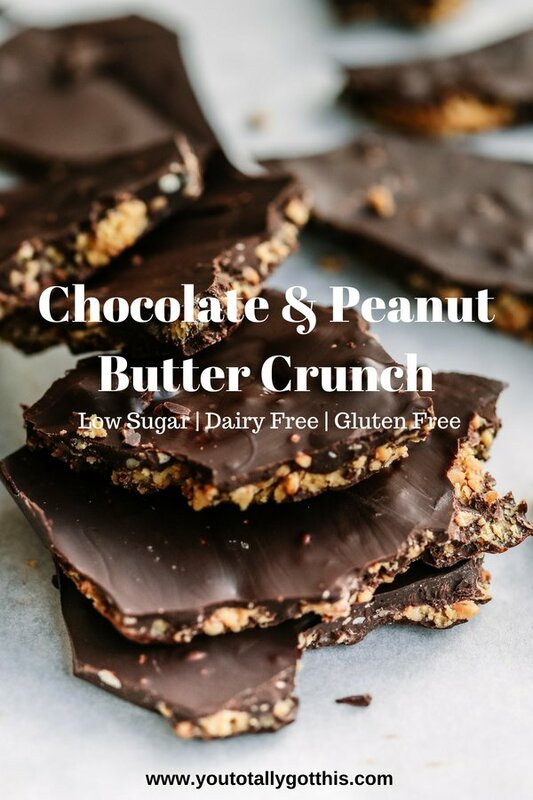 I may or may not have made this chocolate peanut butter crunch 3 weeks running. It really is THAT good and THAT easy. It’s your turn. Let me know what you think. My favourite after dinner treat. 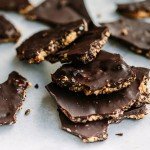 This chocolate and peanut butter crunch is the perfect mix of sweet, salty and crunchy and so easy. It may or may not be legal. Just saying. 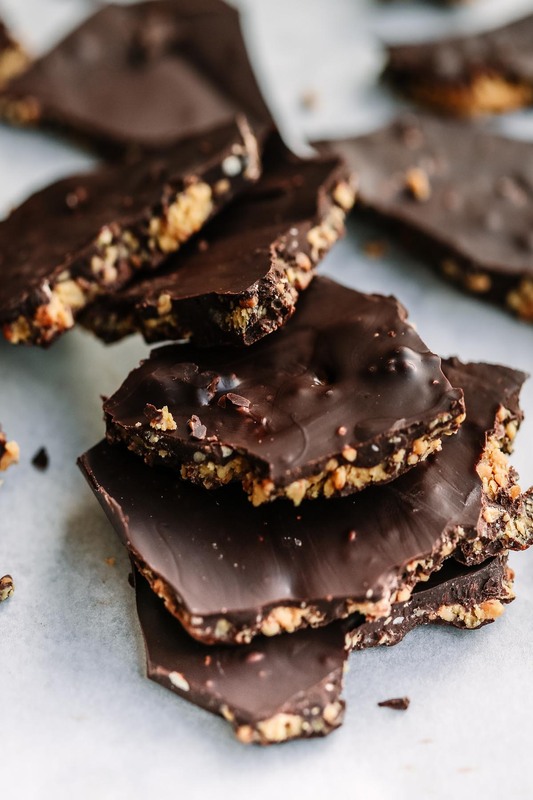 Break the dark chocolate into small pieces and transfer to a microwave safe bowl or jug. Using 30 second bursts, melt the dark chocolate in the microwave, stirring after each burst (it takes 1 minute and 30 seconds in my microwave). Next add the peanut butter to the melted chocolate and stir until the peanut butter is mixed evenly through the chocolate. Pour the chocolate mixture into the lined slice tin. Transfer the slice tin to the fridge and leave the chocolate to set for an hour. If you don’t trust yourself, make a smaller batch by halving the ingredients. Sweet tooth? 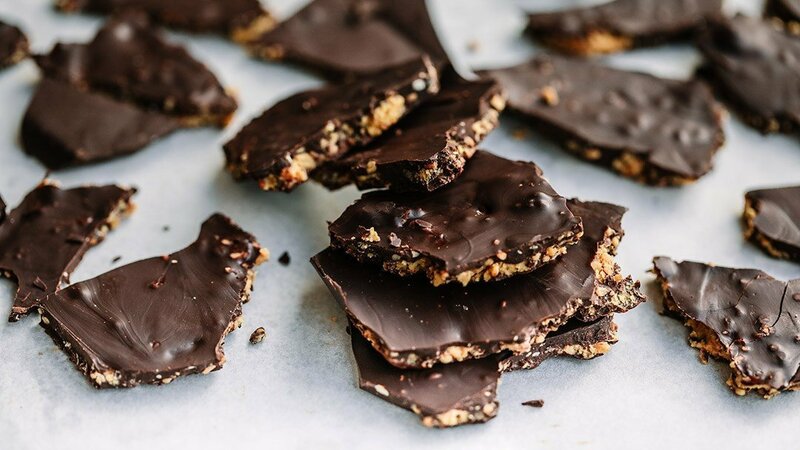 This recipe works with regular milk chocolate, if dark isn’t your thing. I use Lindt dark chocolate (85% cacao or above) – it’s dairy free, gluten free and super low in sugar.